The minimum age for this activity is 6 years old. Children aged 6-18 must have a parent or guardian with them or written consent. Please wear comfortable shoes with a rubber sole. It's recommended to bring a windbreaker, hat, waterproof bag for storage, water, a camera, and sunscreen. This activity is not suitable for people with back problems, heart conditions or pregnant women. 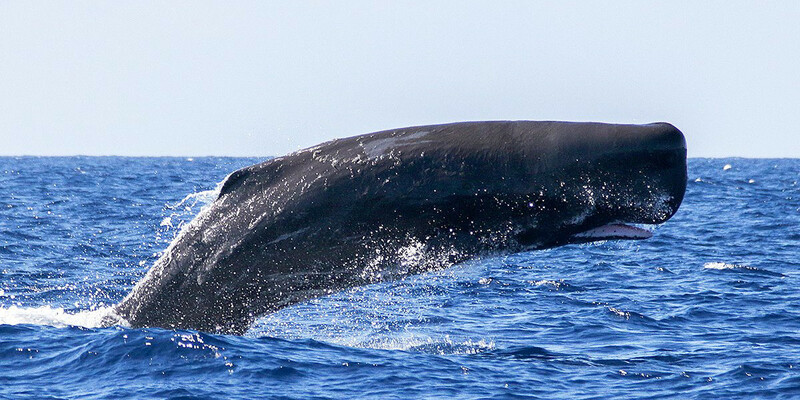 Please bear in mind that whales and dolphins are wild animals and we cannot guarantee sightings of whales or even specific species on each tour. 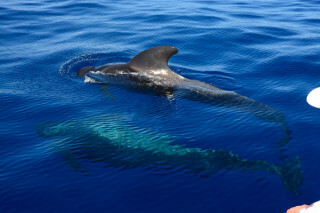 However, in most cases we see whales, dolphins or other cetaceans. 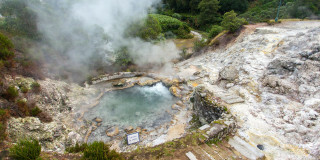 The islands of the Azores support thriving ecosystems both on land and in the water. 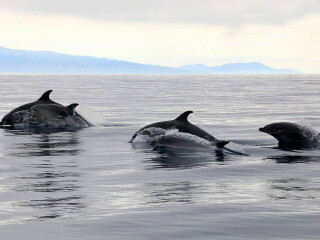 Thanks to its rich fish supply and position along migration routes, the archipelago hosts up to 25 whale and dolphins species. 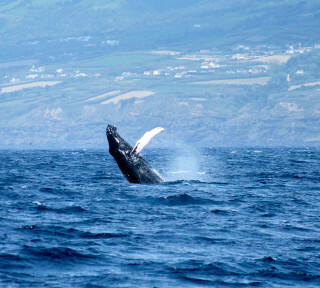 Join a whale-watching excursion out to sea to witness these fantastic sea mammals for yourself. At a marina in Ponta Delgada, you meet your guide and receive your life jacket to board the boat. With expert knowledge, your guide offers scientific knowledge of the cetacean group as he scans the water. With years of strategically placed lookouts, you’ll be in good hands to spot some fins. 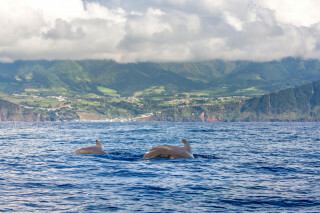 In total, about 25 species of whales or dolphins populate the waters around the Azores. 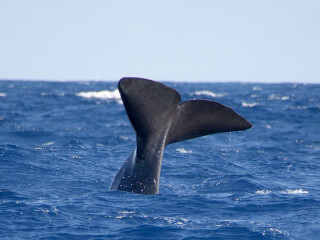 Some pass by on their migration routes, like the fin whale or the famous blue whale. 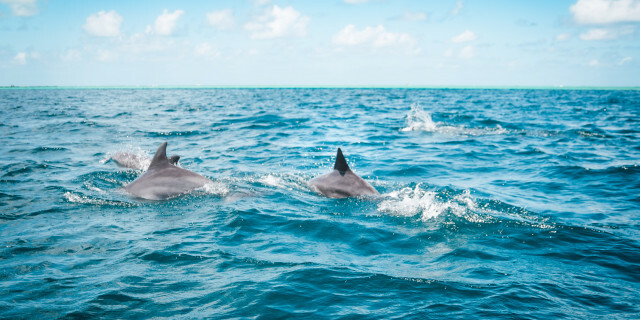 Four species live in the waters year round, the common dolphin, bottlenose dolphin, Risso's dolphin, and sperm whale, so your chances of spotting one of these friendly faces are high. 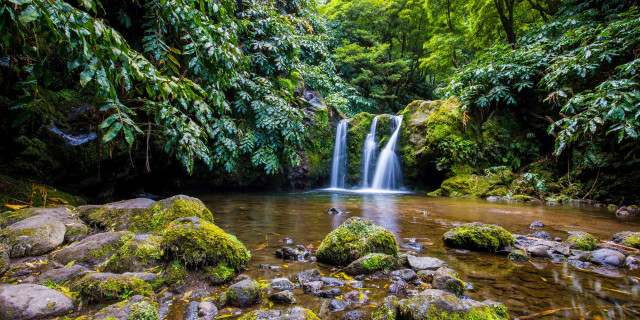 The 2.5-hour boat ride takes you out along the south coast of Sao Miguel, where you can admire the sloping green landscape. Between the bright blue Atlantic Ocean, the shining island sun, and the sites of whales or dolphins, you can’t help but step off the boat with a smile.